All solvents vary in strength and in their capacity to "loosen up" the body of the color, but the solvent with the greatest power is Distilled Turpentine — the only solvent capable of easily dissolving Dammar resin. 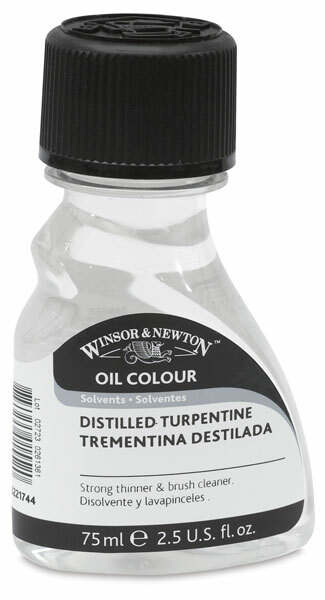 Distilled Turpentine makes a viscous mixture. It evaporates slowly, and is the most hazardous and strongest-smelling solvent commonly used by artists. Keep the bottle tightly closed and away from light to prevent oxidation. 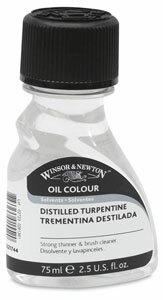 Do not use Distilled Turpentine if it has thickened. Turpentine is flammable and toxic. Use only in a well ventilated area.